The Editors-in-Chief on Watch campaign of Özgür Gündem daily had begun on May 3, 2016 and ended on August 7, 2016. Daily was closed through the Statutory Decree No. 675 issued under the State of Emergency. Relying on the Articles 7(2) and 6(2) of the Anti-Terror Law No. 3713, the 38 Editors-in-Chief on Watch have stood trial on the charge of "propagandizing for a terrorist organization" and for "publishing and spreading statements of terrorist organizations. İhsan Eliaçık, Sebahat Tuncel, Ahmet Abakay, Eşber Yağmurdereli, Hasip Kaplan, Işın Eliçin, Kemal Can, Mustafa Sönmez, Melda Onur, Uğur Karadaş, Nurcan Baysal. A. Kumru Başer, Ahmet Nesin, Ayşe Batumlu, Ayşe Düzkan, Beyza Üstün,Can Dündar, Celal Başlangıç, Celalettin Can, Cengiz Baysoy, Çilem Küçükkkeleş, Derya Okatan, Dicle Anter, Erol Önderoğlu, Ertuğrul Mavioğlu, Faruk Balıkçı, Faruk Eren, Fehim Işık, Hüseyin Tahmaz, Hakkı Boltan, Hasan Cemal, Hasan Hayri Şanlı, İbrahim Bodur, İhsan Çaralan,Julide Kural, Murat Çelikkan, Murat Uyurkulak, Nadire Mater, Necmiye Alpay, Nevin Erdemir, Öncü Akgül, Ragıp Duran, Said Sefa, Şanar Yurdatapan, Şebnem Korur Fincancı, Tuğrul Eryılmaz, Veysi Altay, Yıldırım Türker. * Deniz Türkali's case was dismissed due to expiration of the Statute of Limitation in the investigation. * The cases of Özgür Gündem daily's former editor-in-Chief Hüseyin Aykol, columnists Mehmet Ali Çelebi and Hüseyin Bektaş, who were on duty during the campaign, have been combined with the cases of Düzkan, Duran and Çelebi. The 38 Editors-in-Chief on Watch have stood trial / are standing on the charge of "propagandizing for a terrorist organization" and for "publishing and spreading statements of terrorist organizations under the Articles 7(2) and 6(2) of the Anti-Terror Law No. 3713. 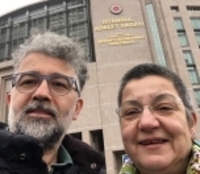 Lawsuits were filed against Ömer Ağın and Dilşah Kocakaya due to their articles published on Özgür Gündem daily, while Celal Başlangıç was the Editor-in-Chief on Watch; against İmam Canpolat due to an article published while Cengiz Baysoy was the Editor-in-Chief on Watch, and against İlham Bakır due to an article published while Jülide Kural was the Editor-in-Chief on Watch. * Editors-in-Chief on Watch, Erol Önderoğlu, Ahmet Nesin and Şebnem Korur Fincancı were arrested in June 2016 and released after 10 days. The next hearing of the three writers whose trials continue, will be held on December, 27, 2017. Verdict has been rendered in the trials of Şanar Yurdatapan, İbrahim Bodur, Cengiz Baysoy, İmam Canpolat, Çilem Küçükkeleş, Nadire Mater, Yıldırım Türker, Hasan Cemal, Faruk Balıkçı, Dicle Anter, Derya Okatan, Kumru Başer, Ayşe Batumlu, Jülide Kural, İlham Bakır, Murat Uyurkulak, Murat Çelikkan, Beyza Üstün, Nevin Erdemir, Hakkı Boltan, Hasan Hayri Şanlı and Tuğrul Eryılmaz. Şanlı, Erdemir, Tahmaz and Boltan have been acquitted. The court has ruled in 22 cases in total, that the editors-in-chief on watch be sentenced to 68,000 TL (15,619 Euros) fine and 235 months and 15 days in prison. All prison sentences except those of Canpolat and Çelikkan, have been deferred. Çelikkan entered Kırklareli Prison on August 14, 2017 and was transferred to open prison on October 14, 2017. He was released on October 21, 2017. Özgür Gündem Managing Editor İnan Kızılkaya is defendant in all 38 cases. His case was separated from the others in the trials together with the other Editors-in-Chief on Watch. İstanbul 23rd Heavy Criminal Court is combining Kızılkaya's case with the main trial. In the main trial, Özgür Gündem Consultant Board members Necmiye Alpay, Aslı Erdoğan, Ragıp Zarakolu, Filiz Koçali, Eren Keskin, Editors-in-Chief Zana Kaya, İnan Kızılkaya, Kemal Sancılı and Bilge Oykut are standing trial. Sancılı has still been arrested as part of the lawsuit. Parliamentary Inquiry by CHP’s Tanrıkulu: Is Secularism Propaganda a Crime? Comments Off on Parliamentary Inquiry by CHP’s Tanrıkulu: Is Secularism Propaganda a Crime?